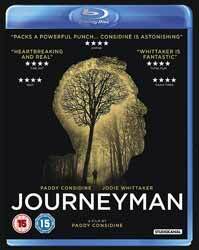 Journeyman (2017. 1 hr, 32 min, 28 sec) is a drama, written and directed by Paddy Considine, who also stars in the film. This is not a film about boxing although the sport is the background of the unfolding drama. The story quickly skips over Matty’s fight which causes him brain damage, we do not even witness any of his initial medical treatment. Matty (Considine) returns home more child than man. His wife, Emma (Jodie Whittaker) must contend not only with their baby daughter, but also with a grown man with limited understanding and emotional control. His memory has also been detrimentally affected. The drama is mainly confined to the house Matty shares with his wife. What should be a joyous welcome home becomes increasingly difficult for Emma. The machismo world of Matty’s boxing friends do not know how to deal with the changes in their friend and so they stay away further isolating the couple. On the one hand this has the effect of making their environment very claustrophobic as neither Matty nor his wife can really get away from each other. This also means that the film has more of a quality of a superior television drama than it does a feature film. Things do not go well. Matty has spent his whole life engaging in acts of violence as a form of sport and now he is damaged, parts of that remain, but without the restraint. The film explores the themes of identity and whether there is enough of Matty left to struggle back to some semblance of normality. Considine puts in a good performance as the damaged Matty, full of new mannerisms and tics, trying to navigate a world which is almost new to him, with a limited ability to interact with his wife. Some of the most emotionally charged scenes are those played out between Considine and Whittaker. Emma is portrayed with a stoic bravery and Whittaker portrays a woman who will fight for every glimmer of the husband she once knew. The second half of the film takes an odd turn as it changes Emma into a possible unintended villain. It does however allow the reintroduction of Matty’s boxing friends and the exploration of masculinity in an emotional environment. The Blu-ray is well served with audio options for either a 2.0 stereo LPCM and 5.1 DTS-HD master Audio Track. There is an interesting full-length commentary from Considine, as well as English subtitles and an audio description track. On the extras side you get an Interview with Considine and Boxing Coach, Dom Ingle (5 min, 06 sec) as well as two extended scenes, Post-fight Interview (6 min, 24 sec) and Head to Head (17 min, 35 sec) with Matty and Bryte bad mouthing each other before their fight. Although the film makes the odd choice, you can’t take away from either Considine or Whittaker’s performances, it’s a little shame that it changed tack half way through the story.